Pattam Pole Is The Directorial Debut Of The Cameraman Azhagappan. 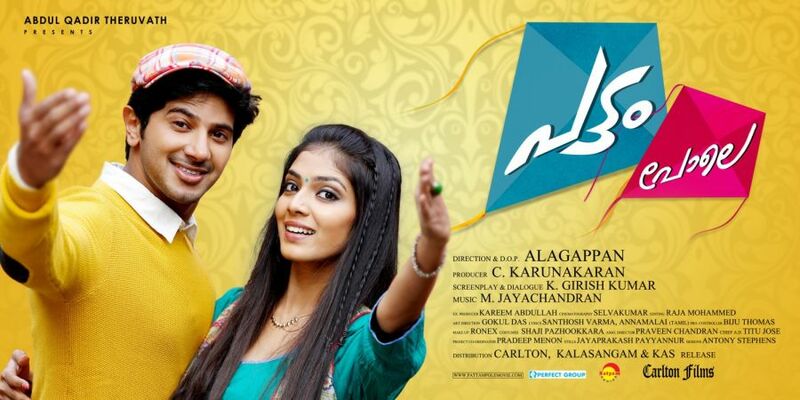 Young Sensational Star Dulquer Salmaan Is The Hero Of The Movie. He Is Playing The Role Of Karthik and Malavika Mohanan as Riya Pairing Him. Girish Kumar Is The Writer Of This Film and Jomon T John Handling The DOP. The Supporting Stars are Archana Kavi, Anoop Menon, Jayaprakash, Lalu Alex, Shraddha Gokul, Anoop Menon etc.M Jayachandran Composing The Music For This Film. This Is The Comeback Movie of The Producer C Karunakaran, His Banner Carlton Films Produced Some Good Films In Malayalam. Chinthavishtayaya Shyamala, Udayananu Tharam, Narendran Makan Jayakanthan Vaka are The Earlier Films From Him. Hope Dulquer Salmaan Will Repeat The History Of ABCD and Neelakasham Pachakadal Chuvanna Bhoomi. Pattam Pole Is a Simple Feel Good Movie, Go For It. Another Hit To Dulqu, Its A Nice Movie. The Movie Is Simple and Watchable, You can watch this with your Family, Satisfaction Guaranteed. Really a good film but climax not up to the expectation. Nice movie . dont go with too much expectaions ..Nice direction ,Location.. It was a below average movie. I do not understand why two well qualified individuals who should supposedly be mature enough to make decisions act like two immature teenagers in this love story. It just doesn’t fit into the context of todays world. There is not much importance for some random characters coming in , there should be a reason why you put specific characters in a movie, even for a short time.The opening shot itself is a night scene and shadows and a hurry berry eloping. It seems so out of place for the viewer .And the songs look like they were just stuffed into the film without having a specific buildup for the requirement of a song.There is not one scene or dialogue that you would take back with you, the choreography is mostly dulquer jumping up and down, the sequence of tap dance was nice, but it was in a long shot that you wont even realise the beauty of the dance. The climax was the most diasastrous thing. It just makes you feel like a fool for watching the whole thing. This looks like an olden times teenage story put into todays world. On the bright side, the camera work is good, location is nice,songs are beautiful and the actors have done their part well.